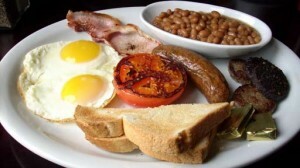 full English breakfast = ideal for hangovers. This mammoth serving comprises fried eggs, bacon, sausages, baked beans, roasted tomato and mushroom, and perhaps hashbrown-type potatoes and/or some other regional variation. crumpet = while visually resembling an English muffin (which, by the way, I don’t think exist here…my British friend only knew of them from the McDonald’s Egg McMuffin…no joking), the crumpet is almost more pancakey in texture. Phenomenal when saturated in melted butter! flapjack = nope, flapjacks are NOT pancakes here. They are more like a thick, chewy granola bar of nuts, grains, and dried fruits. Whatever you call your breakfast, make sure you eat something hardy before hopping in the car with London Relocation Ltd.–our viewing days start early and last all day (don’t worry, you’ll get a lunch break).